Silicon manufacturing appears to have diminished in its luster and seems to be on the verge of extinction in Silicon Valley. The buzz today in the high tech capital of the world seems to be driven primarily by software companies; the likes of Facebook, Google, Intuit, Oracle, and LinkedIn. The traditional silicon chips seem to have stepped aside to give way for Big Data, Data Security, Mobile Apps, and Cloud Storage. The Valley which was traditionally recognized largely for its dominance in Semiconductors still boasts the highest concentration of companies involved in the design and development of silicon Integrated Circuits (ICs). However, much of the silicon wafer fabrication facilities have moved offshore, primarily to the Asia Pacific region. This has led to a score of serious risks such as loss of IP (intellectual property), lack of control over the production process, and the danger of finding these components in the gray market. There are literally just a hand full of companies that have found a way to continue both innovating as well as “manufacturing” silicon products in Silicon Valley. OnChip Devices, Inc. is one such company that has successfully found a way to produce a wide range of silicon components in Santa Clara, CA. 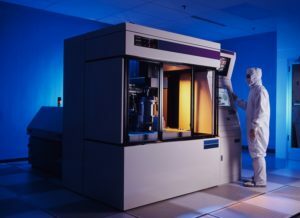 The company has announced that it is now offering wafer foundry services to fabless Semiconductor companies. OnChip’s wafer foundry offers Thin Film, CMOS, and BiPolar processes and has produced more than 250 different high-volume products under the OnChip brand as well as for other companies globally. With installed capacity of over 10,000 wafers per month and current utilization of less than 30%, this state-of-the-art fab offers high quality wafers with competitive pricing and very short turnaround time. The fab produces 4”, 5”, and 6” wafers at 2µ to 5µ BiCMOS process technology focusing primarily on Analog products. OnChip’s wafer manufacturing facility has been granted the ISO 9001:2008 certification and strives to continuously improve its quality as well as the cycle time. The processing time for raw wafers is typically 6 to 8 weeks. With a workforce led by a very successful and long-tenured management team, the facility conducts frequent on-site trained maintenance for increased equipment uptime. In addition to silicon wafer fabrication, OnChip also offers various other services such as testing, dicing, and IC packaging. OnChip’s wafer foundry is committed to providing low cost non-recurring engineering (NRE) and setup charges, short lead-times, and high quality products and services. Please contact sales@onchip.com for a quote or additional information. OnChip Devices is headquartered in Santa Clara, CA and is a global leader in Integrated Passive Devices. With its own silicon fabrication facility and strong partnerships with full turn-keys assembly and test houses in Asia, OnChip is offering state-of-the-art silicon and ceramic solutions for High-brightness LED, Computing, and Consumer Electronics.